Will your class escape in time? Uh oh! The ringmaster has lost all his circus performers and animals! 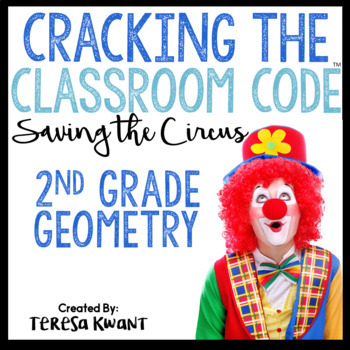 Students must help the ringmaster breakout of this risky situation by solving a string of clues hidden around the classroom. This is a review game for the math concepts taught in 2nd, under the geometry domain. This game should be played as a whole group activity. This is such a fun way to assess students’ knowledge and understanding. My students are completely engaged while doing this activity. Such a well and thought out game! My kiddos loved it! My students absolutely loved this activity!! Love all of these escape rooms! My 2nd graders loved this after our shape unit! This is perfect for reinforcing geometry skills! Excited to try this with my students. Great fun!! Engaging and educational! Perfect review for our Geometry test last week! Can’t wait to use it again next year! My kids and I absolutely loved this! I am so thankful for how you step by step laid it out there for how to set it up! It was a life saver! I also love that I only have to prep it once and can use it multiple years. I just have to print like three pages again. Some items like this you have to prep again every year! Everyone needs hit resource!! Can’t wait to use this with my class!